When discussing science policy and the state of biomedical research, there’s a worry that ideas of how to make changes and generate policies will simply stop there, at the point of discussion. To elicit change, it is not only necessary to generate ideas, but to find ways and means of implementing them—or, if it becomes apparent that there is a key assumption and no underlying data, to find ways of collecting and disseminating data. In a conference setting, so many people come from diverse backgrounds with unique perspectives, ideas, and approaches to problems, that you often generate great new research ideas through discussion and this is often the start of collaborations (see this post that discusses starting collaborations at meetings). At biomedical research meetings, it is often just not practical to begin scientific work together at the conference: you need a lab. But what if you bring together a group of people with ideas and enthusiasm and all you need are computers and everyday technology to carry out research or get started on a project? Taking discussions and immediately putting them to use in working toward answering questions and solving problems can be achieved by including space at an annual meeting for a “Hack Day.” Below are some answers to general questions about Hack Days and how to start them. 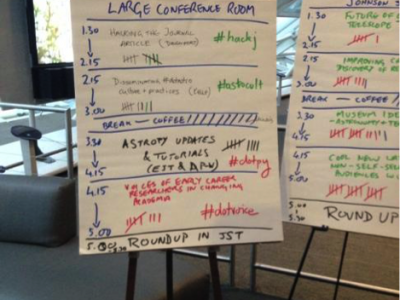 What is a ‘Hack Day’? A Hack Day is an event where people participate in groups to address a problem or subset of problems using practical solutions. Often, this involves carrying out a project resulting in publications, proposals, website development, production of surveys and blog posts, videos with information, and coding for more computing-oriented solutions. 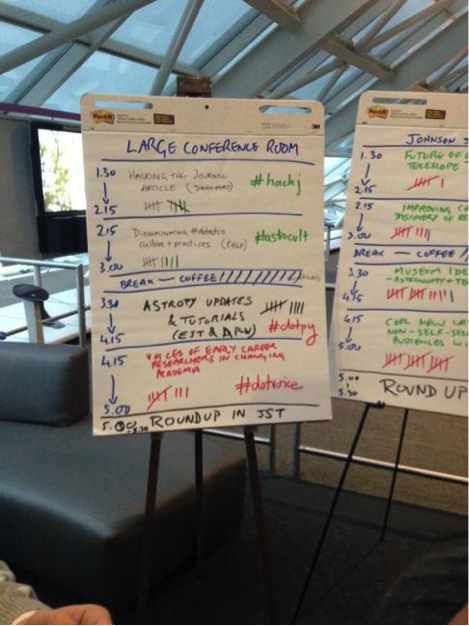 For a great guide to Hack Day events, see “Science hackathons for developing interdisciplinary research and collaborations” (Groen and Calderhead 2015). Do I need to code to participate in a ‘Hack Day’? No, you just need to be willing to participate. Hack Day activities can range from generating open source code to address a particular problem, to web design, to blogging, data curation, and even activities like music parody videos. You can see examples from the Science Hack Day organization of what goes on at their events and what a Hack Day involves, ranging from practical engineering designs of robotics components, design of code to tackle particular problems, and collection of data to directly tackle a problem and produce literature addressing it. If the concept of a “Hack Day” sounds intimidating, think of it more of “Science in Action”—taking the time to not just talk about data we need or policies we want to implement, but HOW we can do this. Some Hack Day projects can be something as simple as a group of people together combing through lab websites and LinkedIn to find out what careers lab alumni end up in in order to try to generate data on where graduate students and postdocs are likely to end up, as a letter-writing campaign in response to calls from federal funding institutions for information on policy changes, or making videos such as this one to advocate and justify public investment in basic research. What are time commitments involved in Hack Days? The Hack Day itself can often be quite an intense day, fueled by coffee, snacks, and enthusiasm to work through a project. Those wanting to take a lead on a project will no doubt commit themselves to more intense involvement; for others, participation on the day may be enough to assist in getting the project done. After the Hack Day, there may be some more commitment involved in getting the project disseminated and again this can be driven at different levels, by the organizers (who will clearly be most invested in producing the output of the Hack Day) and by project leaders, who will most likely want to spend time after the Hack Day in figuring out how to make their product available to the community. Motivation may be tough, and the best way to stay motivated is to really think about a project you would be interested in, want to come to fruition, and are invested in seeing appear as output of the Hack Day. What are current opportunities to participate in Hack Days? You can get involved with Science Hack Day events—including organizing your own—through the Science Hack Day organization or 2020 Science. On October 24 at the upcoming Future of Research meeting in Boston, there will be an opportunity to participate in an event like this focusing on the biomedical workforce. The aim of the meeting is to discuss transparency in terms of career outcomes for scientists, diversity in STEM, transparency in science publishing, and more over the course of the meeting in the previous two days. The idea is to then use the discussions to generate practical and actionable outcomes using a Science Hacktivism Day. The actual projects of the Hack Day are entirely open to participants to suggest and focus on, based on problems and issues raised and discussed during the meeting about the shape, size, and structure of the biomedical workforce. Efforts are under way to make sure the whole meeting is live-streamed and the hope is to include participating groups from across the country by remote participation. The goal is to generate innovative tools, programs, or strategies to address key problems concerning the research workforce and the plan is to award prizes to the projects deemed best by a panel of judges, and to publish the results. What problems about the biomedical research workforce would YOU like to see addressed? Have any ideas for projects and issues to address at a Hack Day about the biomedical workforce? Please comment below!